The first time we experienced the Italian hunters in action, we were shocked! And then, after we got to know how sweet and adorable their prey was, we were even more appalled. Growing up in the wilds of our Indianapolis suburb wasn’t what anyone would call an encounter with nature by any stretch of the imagination. Other than Dads’ Sears BB gun that we used to scare away the squirrels, I only remember firing a gun once in my life. In my teens, we were shooting into the ravine at my brother’s farm with some kind of a “magnum” handgun, the kind used in professional law enforcement. It was a monster gun for sure and I remember the kick jolted me backward, scaring the livin’ daylights out of me. One shot was enough! I was finished! It looked like my options in life had just narrowed down—never to be a policeman or a gangster. Oh well . . . there were still enough choices left that I didn’t let it get me down. Animals have always been considered pets in my world. Well, at least until I finally understood that the packaged chicken at the grocery store didn’t start out that way. And that brings us back to the forever-debated issue of killing animals for food. The argument of “out of sight, out of mind” really only works up to the consumers’ age of reason. The contradiction I struggle with is that I seem to be perfectly willing to let others do the dirty work for me, as I cheerfully buy the meat for Saturday’s barbecue. 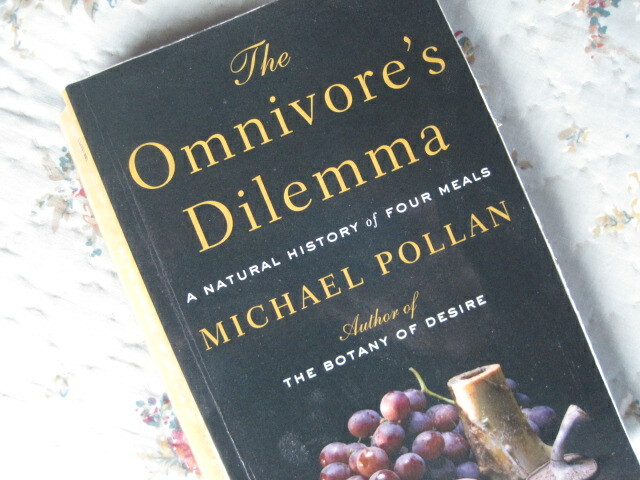 Michael Pollen wrote a delightful book that romps through that very issue called “Omnivore’s Dilemma,” which I highly recommend to anyone who wants to add an entertaining twist to their personal hypocrisy on this issue. Upon moving to Italy, we were totally unprepared for the harsh realities that we would find. Whatever happened to those peaceful reflective moments in the country—the beautiful Tuscany that we’ve all come to love? It’s easy to forget that the “idyllic countryside” has many different faces—ones we were about to meet for the first time. I’ll never forget driving deep into the country, years ago, to look at an isolated property on the market. No fewer than 5 yelping dogs suddenly surround us on the porch, frantically sniffing out some unfortunate animal who had evidently passed that way only moments before. Then the hunters arrived, in their camouflage gear, toting rifles “at the ready.” Our natural instinct was to put our hands up in the air and not move until they said it was okay. What!! Where am I?? I thought this was beautiful and serene Tuscany! 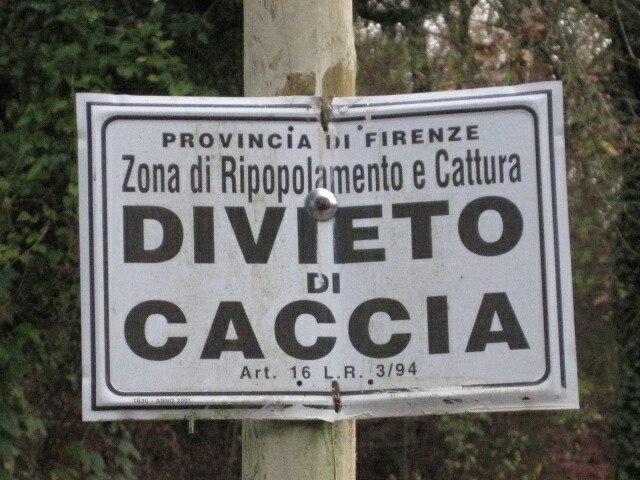 The reason I’m writing this is because today is Battuta di Caccia, hunters’ day here in the ‘hood. Every year about this time, the hunting police declare several days of “authorized” hunting in the prohibited zones as part of their wildlife management program. Yeah, right! 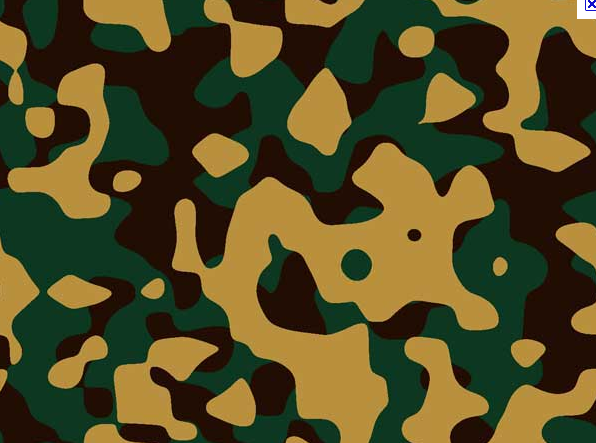 But there are strict rules about hunting conduct and clothing. 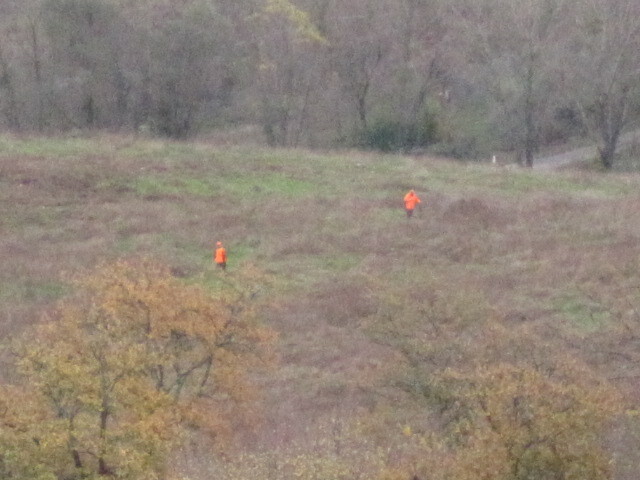 Hunters have to wear bright orange vests or parkas as part of the safety procedure. A number of hunters go together to form teams. Groups of hunters with dogs scour the woods forcing the hiding animals out. Meanwhile, other teams line up ready to ambush the running beasts when they pop out into the open. The process is terribly disturbing for us, and it seems so unfair to the animals—whatever happened to a fair fight? 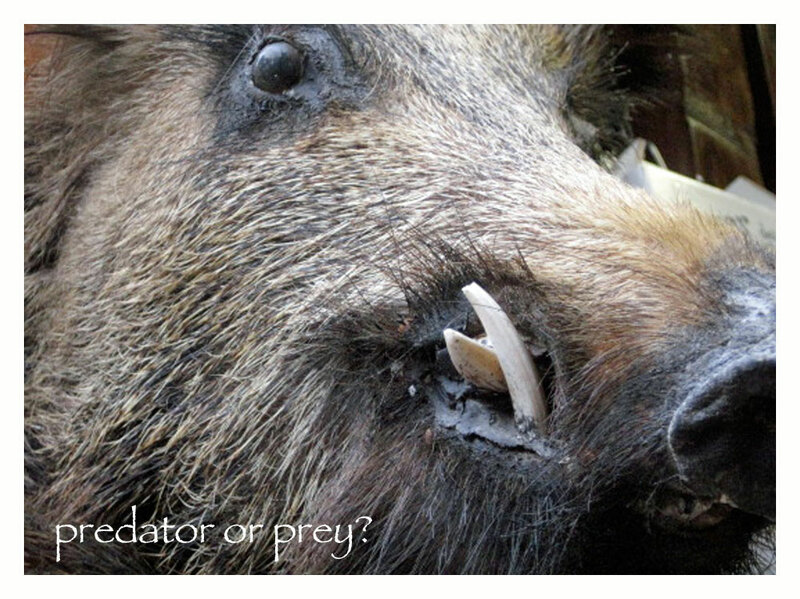 We have witnessed the frightening scene first hand, rooting for the boar running scared across the meadow, hoping to make it safely to the woods on the other side. We’re convinced that, thanks partly to our cheering, a few have actually made it. Others haven’t. There’s no doubt that in this man-made world without natural predators, we would quickly be overrun with animals of all sorts. The hunters actually do provide a great service to those of us unable to fend for ourselves. It would literally be unsafe to live here without careful management of the many critters. And of course, hunting in Italy is a centuries-old tradition that runs deep, passed down generation to generation. Then too, there’s the “sport” of it all, and who (besides us) doesn’t like sports? So, especially when we see fall roll around, we have those recurring conflicted feelings that creep over us about hunting. Like it or not, we’re human, so we have a continuing relationship with this age-old question that’s not at all easy to decipher. However, when all of the talking, debating, shouting and firing of rifles is done, we find one consoling consistency that seems true for us no matter what the logic: we always seem to root for the animals!